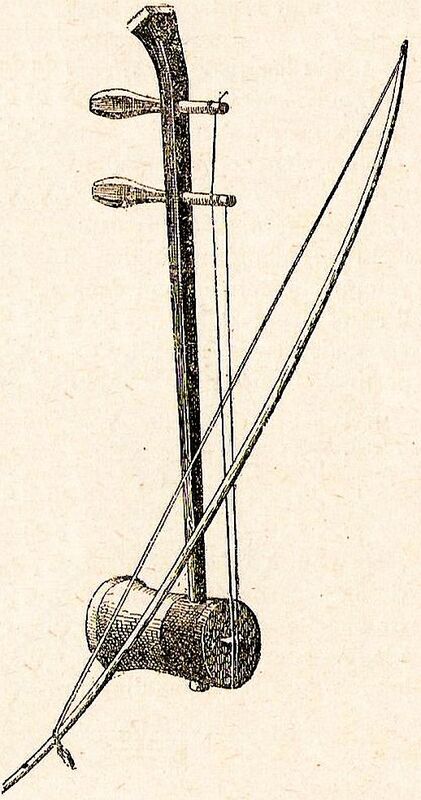 Ravanahatha (ravanhatta, rawanhattha, ravanastron, ravana hastha veena) is an ancient bowed violin invented in Lanka (present day Sri Lanka) by its ruler Ravana during Ramayana era. It is made of a cut coconut shell that is covered with goat hide. A Dandi, made of bamboo, is attached to this shell. The two principle strings are made of steel and horsehair, respectively. The long bow has jingle bells. The Hela tribe of Sri Lanka have early history of using this musical instrument. Ravanhatta is popular among royal families of West India. In Rajasthan and Gujarat, it was the first musical instrument to be learned by princes. The Sangit tradition of Rajasthan further helped in popularizing ravanhatta among women as well. The Ravan Hatta was played on one string which was 22 inches long encompassing the 3 Octaves. Whereas the Violin encompasses the 3 octaves on 4 strings with a finger board which is 5.25 inches long. This 5.25 when multiplied by 4 is 22 inches which was the size of the Ravan Hatta. Both are played with a bow. Hanuman himself was a great musician and singer. 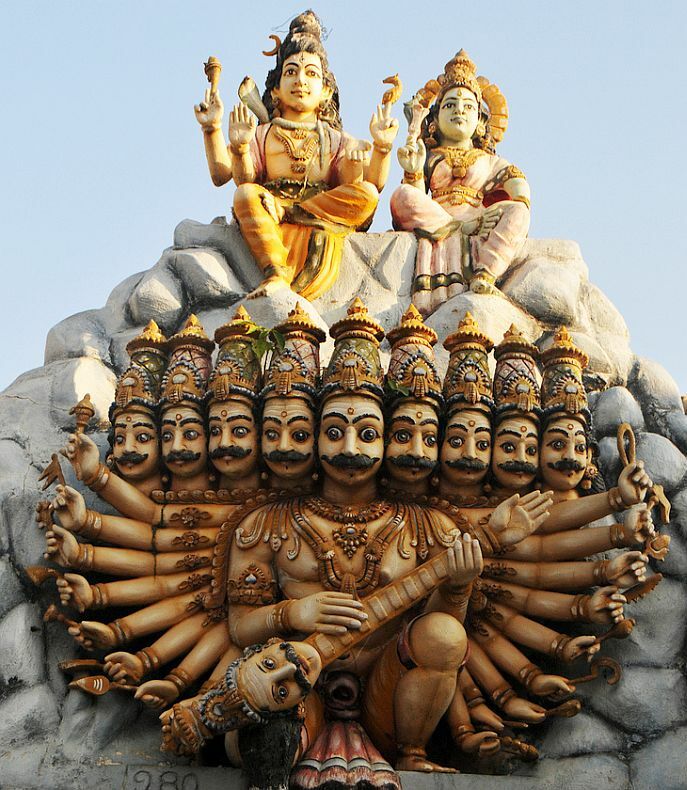 He was fascinated by Ravana’s ability to build his own musical instruments and after the war in which Ravana was killed, he picked up ravanahatha and returned to North India. In India, the ravanahatha is still played in Rajasthan. From India, the ravanahatha traveled westwards to the Middle East and Europe, where in the 9th century, it came to be called the Ravan strong. This is not to be confused with Rudra Veena, which he played by pulling out his own small intestine, to impress Lord Siva to get his Aatma Lingam (which was later installed in Gokarna). The word rAvaNa means ‘a terrifying roar‘ (this name given to him by Lord Siva) when Ravana played Rudraveena to impress him. In modern times, the instrument has been revived by Sri Lankan composer and violinist Dinesh Subasinghe and used in several of his compositions, including Rawan Nada and the Buddhist oratorio Karuna Nadee. Netherlands-based author Patrick Jered has recently written a book (Finding the Demon’s Fiddle) about his quest to discover the origins of the instrument, in which he traces the mythology surrounding the instrument, following the path of Ravana, the Great Demon King of Lanka, through India, via mount Kailash in Tibet, to Trincomalee in Sri Lanka. He concurs with leading musicologist Prof. Joep Bor that the ravanhattha is the oldest extant ancestor of the violin family.